A story about a shy hermit crab who becomes an unexpected hero to his underwater friends. 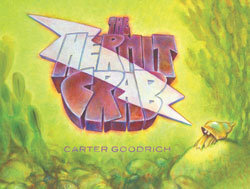 The hermit crab in this story does not set out to be a hero… so begins this beautifully illustrated picture book by Carter Goodrich. Hermit Crab is rather shy and prefers to search for food and keep to himself. One day, he finds a new and different looking shell. One like he had never seen before. When a contraption lands in the center of town, everyone is afraid to go near it until they realize that flounder is trapped underneath. Hermit Crab comes upon the contraption and inadvertently saves flounder. But who’s the hero? Hermit Crab or the shell? The superhero aspect to this story makes it a motivating read aloud for boys. Lesson Idea: This book can act as a catalyst to motivate boys to write. Read aloud this book to your reluctant boy readers/writers. Have students brainstorm components to a superhero story. Conduct a shared writing experience with the group to write a superhero story.